It may be a familiar cliché, but it could not be more appropriate: from the moment the curtain goes up on “Jeeves & Wooster in Perfect Nonsense” absolute hilarity ensues. Based on the works of renowned British humorist P.G. Wodehouse, this show within a show has young English gentlemen, and member of the “idle rich,” Bertie Wooster, staging a one-man show. Quickly realizing that such a project requires a lot of concentration (and work) he enlists his faithful “gentleman’s man” Jeeves, to assist. Jeeves, in turn, brings along game but elderly butler Stebbings. 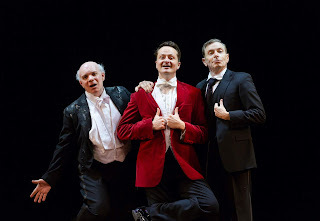 As Bertie regales the appreciative audience with his tale, Jeeves and Stebbings act the parts of all the other people Bertie encounters along the way. Chandler Williams as Bertie Wooster, with his broad smile and jovial demeanor instantly ingratiated himself to the audience. As Bertie tends to be a bit vague, at times his character seemed to be enjoying the show as much as the audience. Looking like a young Colin Firth, with superb clowning skills, he made for a master storyteller as he narrated Bertie’s many misadventures. Arnie Burton, as Jeeves, (and a stuffy judge, and a expert on newts and TWO romantically inclined young ladies!) could convey an entire performance with his facial expressions alone. Unflappable manservant, blowsy paramour and blustery barrister all portrayed perfectly with elastic voice work, energetic eyes and moustache with a mind of its own. Finally, Eddie Korbich as Stebbings (and an overbearing Aunt, and a Scottish butler and a violence prone dictator) completes the “three hander”, delighting with expert physical shtick, fully committing all his resources to the endless silliness. Making its American debut at Hartford Stage the show is directed by the original London director, and Olivier Award winner for it, Sean Foley. The madcap pacing never lags, the fast changes from character to character by the same actor are executed flawlessly and every inch of the stage seems to be filled with madcap energy at every minute. As the night goes on, Alice Power’s set becomes more and more integral to the proceedings, and practically gets its own laugh-lines. Her costume design is vital to the execution of many of the heartiest laughs. The script has not a single false note or wasted word. 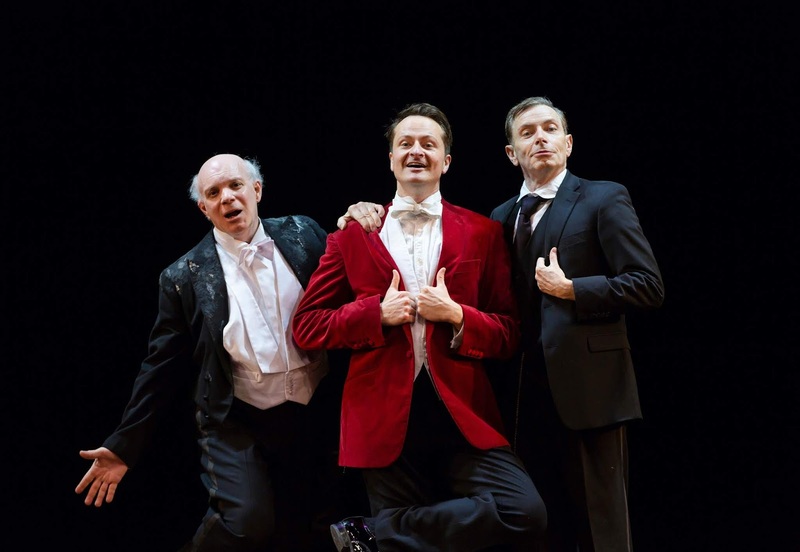 “Jeeves and Wooster in Perfect Nonsense” is truly comedy “perfection”, in which every aspect of the production contributes to the most enjoyable comedic “nonsense” one could ever imagine.